At the moment we are working on O Goshi (major hip). 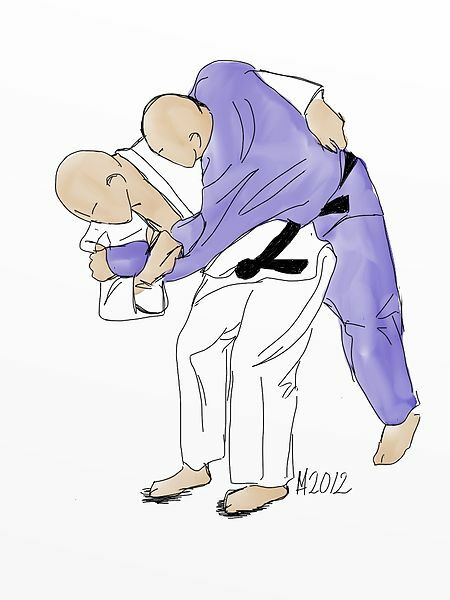 O Goshi involves Tori (the throwing partner) turning Uke (the partner being thrown) over their hip as shown in this illustration. O Goshi is an important throw because it leads into a wide range of more advanced hip techniques. At Big Judo we believe that Judo throwing techniques are often taught in static ways that are both not effective and not in keeping with the dynamic principles of Judo. One of Big Judo's key principles is that we teach all throwing techniques 'on the move'. You will notice that the You Tube clips we put up and our demonstrations will all be done with Uke stepping into the technique.